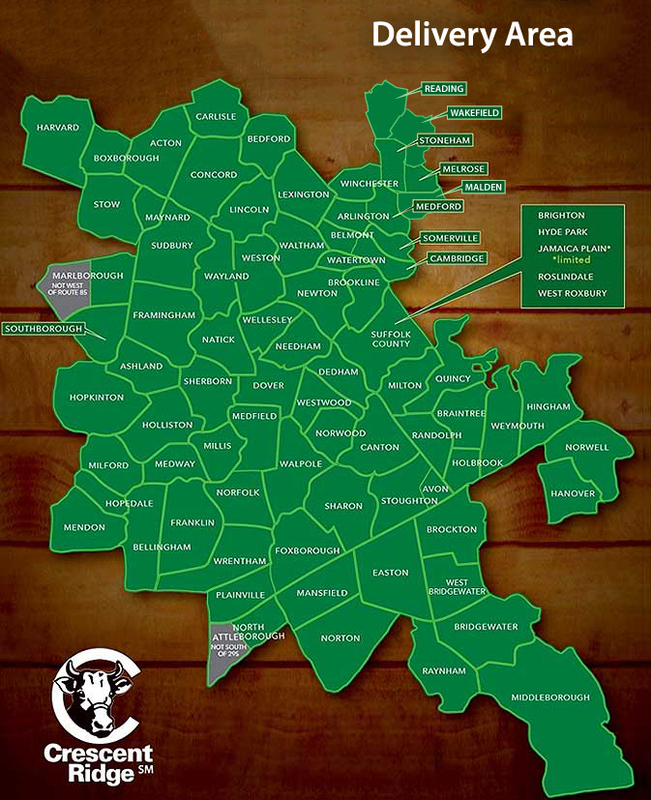 FAQ :: Crescent Ridge Dairy - Serving Greater Boston with home delivery of milk, meat, and more! We have a $15 delivery minimum, that $15 can be inclusive of our $4 delivery fee, so essentially $11 worth of product. Can’t hit the minimum each week? You can set your recurring order to every other week, or you can forgo home delivery and find our milk in your area Whole Foods, select Shaws, Star, Roche Brothers and Big Y Markets. But don’t forget, in addition to milk you can get over 100 locally sourced products delivered! Yes, our delivery fee is $4 per delivery. By the way, if you recommend our service to someone who becomes a customer, we’ll waive both of your delivery fees for 3 months (after their 4th delivery)! Please note delivery minimums apply. Not home? not a problem. We can deliver to a cooler you provide or our Milk Box outside your home. Please note, in the case where there is no cooler or Milk Box left, we won’t leave your order. Milk starts to spoil at 40F, and other products packaged in paper need protection (squirrels love our artisan breads). We’re also happy to deliver directly to a refrigerator in your home or garage as long as you provide a key or garage code. We love a fridge delivery as there’s no worry of milk being out too long in the summer heat, or conversely freezing in the winter. To that point, we recommend adding freezer packs to your cooler in warmer months. And when the temps drop below freezing, you have 20-30 minutes to get milk inside before freezing starts to occur. Frozen milk expands and causes the bottles to break…big mess. Crescent Ridge is not responsible for broken bottles due to freezing so plan accordingly. We deliver weekly. Your address determines your delivery day (Monday – Friday). Time of delivery depends on where you fall along our route. Please note that time of delivery is subject to change as there are many factors that can determine when we arrive – traffic, weather, time of year, substitute drivers and as routes grow your time may change as we add your friends and neighbors to our schedule. Feel free to email us for more information about your specific route and delivery time. What is a recurring or standing order? A recurring or standing order includes the essential products you want delivered each week. But we know not every week is the same, so you can make changes as often as you like. You have until midnight the night before your delivery day to make changes online. The advantage to having a recurring order is that once placed, you can be assured that your essentials will arrive, even if you forget. We highly recommend having a recurring order, but the choice is yours. We’re flexible. What if I need to skip a delivery? If you’re going away or just want to skip a week, no problem! We can accommodate your schedule. Login to your account – go to “MY ACCOUNT”, then select “Delivery Hold” and enter the dates you don’t need service. Please make sure to select a return date BEFORE the date you wish to resume. For example, if you’re returning on May 3rd and your delivery is on May 4th, do not enter the 4th as your return day, as the system will count the entire date range entered as a time when no service is needed. You can also call us and we’ll be happy to assist! Is there a bottle deposit? Our home delivery customers do not pay a bottle deposit; we’ll pick up your bottles each week. If you purchase our milk in the store you’ll pay a $2.50 deposit. Bring your clean bottles back to the store where you purchased, and they’ll refund your deposit. We don’t need caps back, toss those in the recycle bin. Do you want bottles back? Yes please! We’re committed to reusing bottles as much as able and then when they’ve reached the end of their life, they’re recycled. Please rinse them thoroughly and leave them for your driver. Please be aware that bottles that are dirty or that contained spoiled product may not be picked up as it’s a food safety issue; we cannot put spoiled product back in the truck near fresh food out for delivery. We don’t need caps back, toss those in the recycle bin. We require credit card for payment. Upon registering you’ll be asked to enter your credit card. This card will be billed a day or two post-delivery. We do not store any credit card information on our site – card information is stored by a PCI compliant 3rd party company. Check our delivery map – still in our delivery area? If so, call us with your new address and when you’d like to start service, and we’ll determine your new route take it from there. Do you offer one-time delivery? Sorry, once is not enough, we don’t offer one-time delivery. However, if you sign up for regular delivery and for any reason you’re not satisfied, simply cancel. Why not give it a try? Our milk is not certified organic. We get raw milk from our friends at the St. Albans Cooperative in Vermont. The Cooperative aggregates milk from Vermont family farmers and we purchase their highest quality milk. Any farmer working with the Co-Op signs and affidavit that they never treat any of their animals with growth hormones. Also, it’s important to note that ALL MILK is tested for the presence of antibiotics and therefore no milk sold in the US has any antibiotic residue present. Why does your milk taste so good? We’re a small batch bottler, hand crafting just about 2,000 gallons of milk each day on our Sharon farm. When it comes to good taste, it’s the cream that counts. It makes you wonder why big milk companies skim off the cream? At Crescent Ridge, our Whole Milk is never skimmed. In fact, it has about 20% more cream than the federal minimum. So you get all the cream—and all the full, rich taste. Even our 2% and 1% Milk starts as creamy whole milk. Working one small batch at a time, we slowly blend in super-premium, non-fat milk to make the richest 2% and 1% Milk you’ve ever tasted. And after all that care and attention, no plastic for us! Glass preserves the fresh taste, with the added benefit of protecting Mother Nature from thousands of plastic and paper cartons being dumped in landfills. You raise your own beef and pork? Tell me more! We pasture-raise a small herd of beef here on our 44-acre farm. They have lots of room to moooove and enjoy a grass-centered diet, supplemented occasionally with local grains milled by our friends at Ventura Grain in Taunton. Our fields are never treated with fertilizers or pesticides and our herd has access to the barn if they so choose. A source of fresh, clean water is always available. Like our beef, our pork lives in a very large outdoor pen with shelter and a fresh water supply. They enjoy a diet of local vegetables and grains. Our animals are NEVER given any hormones or anti-biotics. They eat well so you eat well. How do you select other products your sell? When adding products to our menu, we look for like-minded, local purveyors who are passionate about what they do and who make exceptional products. We also try to find items that may not be readily available at your local grocery store. Please visit Our Partners section to learn more about our outstanding partners! Are there any days you don’t deliver? We don’t deliver on Thanksgiving, the day after Thanksgiving and Christmas day. Thanksgiving week everyone’s delivery day moves one day earlier with the exception of our Friday routes, they do not receive delivery that week. So Monday customers get delivery on Sunday, Tuesday customers get delivery on Monday, Wednesday customers get delivery on Tuesday, Thursday customers on Wednesday. The week of Christmas the schedule shift will vary given the day of the week the holiday falls on, don’t worry, we’ll give you plenty of advance notice once the schedule change is confirmed. Please note we DO deliver on MLK Day, Presidents Day, Memorial Day, July 4th, Labor Day, Columbus Day and Veterans Day. At Crescent Ridge we strive to satisfy all of our customers. Please email us at info@crescentridge.com or call us at 781-784-2740 if you are not 100% satisfied with our products or services. We have no customer contracts, so if you would like to cancel service simply email us at info@crescentridge.com or call us at 781-784-2740. We can arrange to pick up any outstanding bottles upon service cancellation. Please note if you have purchased our Milk Box, it's yours to keep. If it is still in good condition and would like us to find it another home, let us know and we'll do our best to accommodate. Is the Dairy Bar open year-round? Yes! For more information on our Dairy Bar, Boston Public Market location, ice cream catering and farm events, please visit here.